Emergency physicians conducting a trauma evaluation. Different models for emergency medicine exist internationally. In countries following the Anglo-American model, emergency medicine was originally the domain of surgeons, general practitioners, and other generalist physicians, but in recent decades it has become recognised as a speciality in its own right with its own training programmes and academic posts, and the specialty is now a popular choice among medical students and newly qualified medical practitioners. By contrast, in countries following the Franco-German model, the speciality does not exist and emergency medical care is instead provided directly by anesthesiologists (for critical resuscitation), surgeons, specialists in internal medicine, pediatricians, cardiologists or neurologists as appropriate. In developing countries, emergency medicine is still evolving and international emergency medicine programs offer hope of improving basic emergency care where resources are limited. Emergency Medicine is a medical specialty—a field of practice based on the knowledge and skills required for the prevention, diagnosis and management of acute and urgent aspects of illness and injury affecting patients of all age groups with a full spectrum of undifferentiated physical and behavioral disorders. It further encompasses an understanding of the development of pre-hospital and in-hospital emergency medical systems and the skills necessary for this development. The field of emergency medicine encompasses care involving the acute care of internal medical and surgical conditions. In many modern emergency departments, emergency physicians are tasked with seeing a large number of patients, treating their illnesses and arranging for disposition—either admitting them to the hospital or releasing them after treatment as necessary. They also provide episodic primary care to patients during off hours and for those who do not have primary care providers. Most patients present to emergency departments with low-acuity conditions (such as minor injuries or exacerbations of chronic disease), but a small proportion will be critically ill or injured. Therefore, the emergency physician requires a broad field of knowledge and procedural skills often including surgical procedures, trauma resuscitation, advanced cardiac life support and advanced airway management. They must have some of the core skills from many medical specialities—the ability to resuscitate a patient (intensive care medicine), manage a difficult airway (anesthesiology), suture a complex laceration (plastic surgery), set a fractured bone or dislocated joint (orthopedic surgery), treat a heart attack (cardiology), manage strokes (neurology), work-up a pregnant patient with vaginal bleeding (obstetrics and gynecology), control a patient with mania (psychiatry), stop a severe nosebleed (otolaryngology), place a chest tube (cardiothoracic surgery), and conduct and interpret x-rays and ultrasounds (radiology). This generalist approach can obviate barrier-to-care issues seen in systems without specialists in emergency medicine, where patients requiring immediate attention are instead managed from the outset by speciality doctors such as surgeons or internal physicians. However, this may lead to barriers through acute and critical care specialties disconnecting from emergency care. Emergency medicine can be distinguished from urgent care, which refers to immediate healthcare for less emergent medical issues, but there is obvious overlap and many emergency physicians work in urgent care settings. Emergency medicine also includes many aspects of acute primary care, and shares with family medicine the uniqueness of seeing all patients regardless of age, gender or organ system . The emergency physician workforce also includes many competent physicians who trained in other specialties. 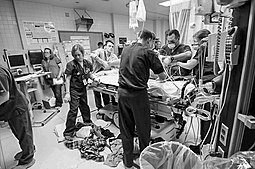 Physicians specializing in emergency medicine can enter fellowships to receive credentials in subspecialties such as palliative care, critical-care medicine, medical toxicology, wilderness medicine, pediatric emergency medicine, sports medicine, disaster medicine, tactical medicine, ultrasound, pain medicine, pre-hospital emergency medicine, or undersea and hyperbaric medicine. The practice of emergency medicine is often quite different in rural areas where there are far fewer other specialties and healthcare resources. In these areas, family physicians with additional skills in emergency medicine often staff emergency departments. Rural emergency physicians may be the only health care providers in the community, and require skills that include primary care and obstetrics. Patterns vary by country and region. In the United States, the employment arrangement of emergency physician practices are either private (with a co-operative group of doctors staffing an emergency department under contract), institutional (physicians with an independent contractor relationship with the hospital), corporate (physicians with an independent contractor relationship with a third-party staffing company that services multiple emergency departments), or governmental (for example, when working within personal service military services, public health services, veterans' benefit systems or other government agencies). In the United Kingdom, all consultants in emergency medicine work in the National Health Service and there is little scope for private emergency practice. In other countries like Australia, New Zealand or Turkey, emergency medicine specialists are almost always salaried employees of government health departments and work in public hospitals, with pockets of employment in private or non-government aeromedical rescue or transport services, as well as some private hospitals with emergency departments; they may be supplemented or backed by non-specialist medical officers, and visiting general practitioners. Rural emergency departments may be headed by general practitioners alone, sometimes with non-specialist qualifications in emergency medicine. Emergency medicine as an independent medical specialty is relatively young. Prior to the 1960s and 1970s, hospital emergency departments (EDs) were generally staffed by physicians on staff at the hospital on a rotating basis, among them family physicians, general surgeons, internists, and a variety of other specialists. In many smaller emergency departments, nurses would triage patients and physicians would be called in based on the type of injury or illness. Family physicians were often on call for the emergency department, and recognized the need for dedicated emergency department coverage. Many of the pioneers of emergency medicine were family physicians and other specialists who saw a need for additional training in emergency care. During this period, groups of physicians began to emerge who had left their respective practices in order to devote their work completely to the ED. In the UK in 1952, Maurice Ellis was appointed as the first "casualty consultant" at Leeds General Infirmary. In 1967, the Casualty Surgeons Association was established with Maurice Ellis as its first President. In the US, the first of such groups was headed by Dr. James DeWitt Mills in 1961 who, along with four associate physicians; Dr. Chalmers A. Loughridge, Dr. William Weaver, Dr. John McDade, and Dr. Steven Bednar at Alexandria Hospital in Alexandria, Virginia, established 24/7 year-round emergency care, which became known as the "Alexandria Plan". It was not until the establishment of American College of Emergency Physicians (ACEP), the recognition of emergency medicine training programs by the AMA and the AOA, and in 1979 a historical vote by the American Board of Medical Specialties that emergency medicine became a recognized medical specialty in the US. The first emergency medicine residency program in the world was begun in 1970 at the University of Cincinnati and the first Department of Emergency Medicine at a US medical school was founded in 1971 at the University of Southern California. The second residency program in the United States soon followed at what was then called Hennepin County General Hospital in Minneapolis, with two residents entering the program in 1971. In 1990 the UK's Casualty Surgeons Association changed its name to the British Association for Accident and Emergency Medicine, and subsequently became the British Association for Emergency Medicine (BAEM) in 2004. In 1993, an intercollegiate Faculty of Accident and Emergency Medicine (FAEM) was formed as a "daughter college" of six medical royal colleges in England and Scotland to arrange professional examinations and training. In 2005, the BAEM and the FAEM were merged to form the College of Emergency Medicine, now the Royal College of Emergency Medicine, which conducts membership and fellowship examinations and publishes guidelines and standards for the practise of emergency medicine. Many hospitals and care centers feature departments of emergency medicine, where patients can receive acute care without an appointment. While many patients are treated for life-threatening injuries, others utilize the emergency department (ED) for non-urgent reasons such as headaches or a cold. (defined as "visits for conditions for which a delay of several hours would not increase the likelihood of an adverse outcome"). As such, EDs can adjust staffing ratios and designate an area of the department for faster patient turnover to accommodate a variety of patient needs and volumes. Policies have been developed to better assist ED staff(such as Emergency Medical Technicians, paramedics, and mid level providers such as nurse practitioners and physicians assistants) direct patients towards more appropriate medical settings, such as their primary care physician, urgent care clinics or detoxification facilities. The emergency department, along with welfare programs and healthcare clinics, serves as a critical part of the healthcare safety net for patients who are uninsured, cannot afford medical treatment or do not understand how to properly utilize their coverage. Emergency physicians are compensated at a higher rate in comparison to some other specialities, ranking 10th out of 26 physician specialties in 2015, at an average salary of $306,000 annually. They are compensated in the mid-range (averaging $13,000 annually) for non-patient activities, such as speaking engagements or acting as an expert witness; they also saw a 12% increase in salary from 2014 – 2015 (which was not out of line with many other physician specialties that year). While emergency physicians work 8–12 hour shifts and do not tend to work on-call, the high level of stress and need for strong diagnostic and triage capabilities for the undifferentiated, acute patient contributes to arguments justifying higher salaries for these physicians. Emergency care must be available every hour of every day, and requires a doctor to be available on site 24/7, unlike an outpatient clinic or some other hospital departments that have more limited hours, and may only call a physician in when needed. The necessity to have a physician on staff along with all other diagnostic services available every hour of every day is thus a costly arrangement for hospitals. There are some challenges with implementing these quality-based incentives in emergency medicine in that patients are often not given a definitive diagnosis in the ED, making it difficult to allocate payments through coding. Additionally, adjustments based on patient risk-level and multiple co-morbidities for complex patients further complicate attribution of positive or negative health outcomes, and it is difficult to assess whether much of the costs are a direct result of the emergent condition being treated in acute care settings. It is also difficult to quantify the savings due to preventive care during emergency treatment (i.e. workup, stabilizing treatments, coordination of care and discharge, rather than a hospital admission). Thus, ED providers tend to support a modified fee-for-service model over other payment systems. Some patients without health insurance utilize EDs as their primary form of medical care. Because these patients do not utilize insurance or primary care, emergency medical providers often face problems of overutilization and financial loss, especially since many patients are unable to pay for their care (see below). ED overuse produces $38 billion in wasteful spending each year (i.e. care delivery and coordination failures, over-treatment, administrative complexity, pricing failures, and fraud), and unnecessarily drains departmental resources, reducing the quality of care across all patients. While overuse is not limited to the uninsured, the uninsured comprise a growing proportion of non-urgent ED visits – insurance coverage can help mitigate overutilization by improving access to alternative forms of care and lowering the need for emergency visits. A common misconception pegs frequent ED visitors as a major factor in wasteful spending. However, frequent ED users make up a small portion of those contributing to overutilization and are often insured. Injury and illness are often unforeseen, and patients of lower socioeconomic status are especially susceptible to being suddenly burdened with the cost of a necessary ED visit. If they are unable to pay for the care they received, then the hospital (which under the Emergency Medical Treatment and Active Labor Act (EMTALA), as discussed below, is obligated to treat emergency conditions regardless of ability to pay) faces an economic loss for this uncompensated care. Fifty-five percent of emergency care is uncompensated, and inadequate reimbursement has led to the closure of many EDs. Policy changes (such as the Affordable Care Act) designed to decrease the number of uninsured people have been projected to drastically lower the amount of uncompensated care. In addition to decreasing the uninsured rate, ED overutilization might be mitigated by improving patient access to primary care and increasing patient flow to alternative care centers for non-life-threatening injuries. Financial disincentives, patient education, as well as improved management for patients with chronic diseases can also reduce overutilization and help to manage costs of care. Moreover, physician knowledge of prices for treatment and analyses, discussions on costs with their patients, as well as a changing culture away from defensive medicine can improve cost-effective use. A transition towards more value-based care in the ED is an avenue by which providers can contain costs. Doctors that work in the EDs of hospitals receiving Medicare funding are subject to the provisions of EMTALA. EMTALA was enacted by the US Congress in 1986 to curtail "patient dumping", a practice whereby patients were refused medical care for economic or other non-medical reasons. Since its enactment, ED visits have substantially increased, with one study showing a rise in visits of 26% (which is more than double the increase in population over the same period of time). While more individuals are receiving care, a lack of funding and ED overcrowding may be impacting quality. To comply with the provisions of EMTALA, hospitals, through their ED physicians, must provide a medical screening and stabilize the emergency medical conditions of anyone that presents themselves at a hospital ED with patient capacity. If these services are not provided, EMTALA holds both the hospital and the responsible ED physician liable for civil penalties of up to $50,000 each. While both the Office of Inspector General, U.S. Department of Health and Human Services (OIG) and private citizens can bring an action under EMTALA, courts have uniformly held that ED physicians can only be held liable if the case is prosecuted by OIG (whereas hospitals are subject to penalties regardless of who brings the suit). Additionally, the Center for Medicare and Medicaid Services (CMS) can discontinue provider status under Medicare for physicians that do not comply with EMTALA. Liability also extends to on-call physicians that fail to respond to an ED request to come to the hospital to provide service. While the goals of EMTALA are laudable, commentators have noted that it appears to have created a substantial unfunded burden on the resources of hospitals and emergency physicians. As a result of financial difficulty, between the period of 1991–2011, 12.6% of EDs in the US closed. Alternatively, emergency medicine in urban areas consists of diverse provider groups including PCPs, nurse practitioners, physicians, and registered nurses who coordinate with specialists in both inpatient and outpatient facilities to address patients’ needs, more specifically in the ED. For all systems regardless of funding source, EMTALA mandates EDs to conduct a medical examination for anyone that presents at the department, irrespective of paying ability. Non-profit hospitals and health systems – as required by the ACA – must provide a certain threshold of charity care "by actively ensuring that those who qualify for financial assistance get it, by charging reasonable rates to uninsured patients and by avoiding extraordinary collection practices". While there are limitations, this mandate provides support to many in need. That said, despite policy efforts and increased funding and federal reimbursement in urban areas, the triple aim (of improving patient experience, enhancing population health, and reducing the per-capita cost of care) remains a challenge without providers' and payers' collaboration to increase access to preventive care and decrease in ED usage. As a result, many experts support the notion that emergency medical services should serve only immediate risks in both urban and rural areas. As stated above, EMTALA includes provisions that protect patients from being turned away or transferred before adequate stabilization. Upon making contact with a patient, EMS providers have a responsibility to diagnose and stabilize a patient’s condition without regard for ability to pay. In the prehospital setting, providers must exercise appropriate judgement in choosing a suitable hospital for transport. Hospitals can only turn away incoming ambulances if they are on diversion and incapable of providing adequate care. However, once a patient has arrived on hospital property, care must be provided. At the hospital, contact with the patient is first made by a triage nurse who determines the appropriate level of care needed. According to the Mead v. Legacy Health System, a patient-physician relationship is established when "the physician takes an affirmative action with regard to the care of the patient". Initiating such a relationship forms a legal contract in which the physician must continue to provide treatment or properly terminate the relationship. This legal responsibility can extend to physician consultations and on-call physicians even without direct patient contact. In emergency medicine, termination of the patient-provider relationship prior to stabilization or without handoff to another qualified provider is considered abandonment. In order to initiate an outside transfer, a physician must verify that the next hospital can provide a similar or higher level of care. Hospitals and physicians must also ensure that the patient’s condition will not be further aggravated by the transfer process. The unique setting of emergency medicine practice presents a challenge for delivering high quality, patient-centered care. Clear, effective communication can be particularly difficult due to noise, frequent interruptions, and high patient turnover. The Society for Academic Emergency Medicine has identified five tasks that are essential to patient-physician communication: establishing rapport, gathering information, giving information, providing comfort, and collaboration. The miscommunication of patient information is a key source of medical error; minimizing shortcoming in communication remains a topic of current and future research. Many circumstances, including the regular transfer of patients in the course of emergency treatment, and crowded, noisy and chaotic ED environments, make emergency medicine particularly susceptible to medical error and near misses. One study identified an error rate of 18 per 100 registered patients in one particular academic ED. Another study found that where a lack of teamwork (i.e. poor communication, lack of team structure, lack of cross-monitoring) was implicated in a particular incident of ED medical error, "an average of 8.8 teamwork failures occurred per case [and] more than half of the deaths and permanent disabilities that occurred were judged avoidable." Unfortunately, certain cultural (i.e. "a focus on the errors of others and a ‘blame-and-shame’ culture") and structural (i.e. lack of standardization and equipment incompatibilities) aspects of emergency medicine often result in a lack of disclosure of medical error and near misses to patients and other caregivers. While concerns about malpractice liability is one reason why disclosure of medical errors is not made, some have noted that disclosing the error and providing an apology can mitigate malpractice risk. Ethicists uniformly agree that the disclosure of a medical error that causes harm is the duty of a care provider. The key components of disclosure include "honesty, explanation, empathy, apology, and the chance to lessen the chance of future errors" (represented by the mnemonic HEEAL). The nature of emergency medicine is such that error will likely always be a substantial risk of emergency care. Maintaining public trust through open communication regarding harmful error, however, can help patients and physicians constructively address problems when they occur. Emergency Medicine is a primary, or first-contact point of care for patients requiring the use of the health care system. Specialists in Emergency Medicine are required to possess specialist skills in acute illness diagnosis and resuscitation. Emergency physicians are responsible for providing immediate recognition, evaluation, care, stabilization, to adult and pediatric patients in response to acute illness and injury. There are a variety of international models for emergency medicine training. Among those with well developed training programs there are two different models: a "specialist" model or "a multidisciplinary model". Additionally, in some countries the emergency medicine specialist rides in the ambulance. For example, in France and Germany the physician, often an anesthesiologist, rides in the ambulance and provides stabilizing care at the scene. The patient is then triaged to the appropriate department of a hospital, so emergency care is much more multidisciplinary than in the Anglo-American model. In countries such as the US, the United Kingdom, Canada and Australia, ambulances crewed by paramedics and emergency medical technicians respond to out-of-hospital emergencies and transport patients to emergency departments, meaning there is more dependence on these health-care providers and there is more dependence on paramedics and EMTs for on-scene care. Emergency physicians are therefore more "specialists", since all patients are taken to the emergency department. Most developing countries follow the Anglo-American model: 3 or 4 year independent residency training programs in emergency medicine are the gold standard. Some countries develop training programs based on a primary care foundation with additional emergency medicine training. In developing countries, there is an awareness that Western models may not be applicable and may not be the best use of limited health care resources. For example, specialty training and pre-hospital care like that in developed countries is too expensive and impractical for use in many developing countries with limited health care resources. International emergency medicine provides an important global perspective and hope for improvement in these areas. In Argentina, the SAE (Sociedad Argentina de Emergencias) is the main organization of Emergency Medicine. There are a lot of residency programs. Also it is possible to reach the certification with a two-year postgraduate university course after a few years of ED background. For medical doctors not (and not wishing to be) specialists in Emergency Medicine but have a significant interest or workload in emergency departments, the ACEM provides non-specialist certificates and diplomas. In Chile, Emergency and Emergency Medicine begins its journey with the first specialty program at the beginning of the 90s, at the University of Chile. Currently it is a primary specialty legally recognized by the Ministry of Health since 2013, and has multiple training programs for specialists, notably those of the University of Chile, Pontifical Catholic University of Chile, San Sebastian University - MUE and University of Santiago of Chile (USACH).Currently, and with the aim of strengthening the specialty at the country level, FOAMed initiatives have emerged (free open access medical education in emergency medicine) and the #ChileEM initiative that brings together the programs of the Universidad San Sebastián / MUE, Universidad Católica de Chile and Universidad de Chile, with the objective of holding joint clinical meetings between the main training programs, on a regular basis and open to all the health team working in the field of urgency. The specialists already trained are grouped in the Chilean Society of Emergency Medicine (SOCHIMU). A 5-year residency leading to the designation of FRCP(EM) through the Royal College of Physicians and Surgeons of Canada (Emergency Medicine Board Certification – Emergency Medicine Consultant). A 1-year emergency medicine enhanced skills program following a 2-year family medicine residency leading to the designation of CCFP(EM) through the College of Family Physicians of Canada (Advanced Competency Certification). The CFPC also allows those having worked a minimum of 4 years at a minimum of 400 hours per year in emergency medicine to challenge the examination of special competence in emergency medicine and thus become specialized. CCFP(EM) emergency physicians outnumber FRCP(EM) physicians by a ratio of about 3 to 1, and they tend to work primarily as clinicians with a smaller focus on academic activities such as teaching and research. FRCP(EM) Emergency Medicine Board specialists tend to congregate in academic centers and tend to have more academically oriented careers, which emphasize administration, research, critical care, disaster medicine, and teaching. They also tend to sub-specialize in toxicology, critical care, pediatrics emergency medicine, and sports medicine. Furthermore, the length of the FRCP(EM) residency allows more time for formal training in these areas. The current post-graduate Emergency Medicine training process is highly complex in China. The first EM post-graduate training took place in 1984 at the Peking Union Medical College Hospital. Because specialty certification in EM has not been established, formal training is not required to practice Emergency Medicine in China. About a decade ago, Emergency Medicine residency training was centralized at the municipal levels, following the guidelines issued by The Ministry of Public Health. Residency programs in all hospitals are called residency training bases, which have to be approved by local health governments. These bases are hospital-based, but the residents are selected and managed by the municipal associations of medical education. These associations are also the authoritative body of setting up their residents' training curriculum. All medical school graduates wanting to practice medicine have to go through 5 years of residency training at designated training bases, first 3 years of general rotation followed by 2 more years of specialty-centered training. In Germany, emergency medicine is not handled as a specialisation (Facharztrichtung), but any licensed physician can acquire an additional qualification in emergency medicine through an 80-hour course monitored by the respective "Ärztekammer" (medical association, responsible for licensing of physicians). A service as emergency physician in an ambulance service is part of the specialisation training of anaesthesiology. Emergency physicians usually work on a volunteering basis and are often anaesthesiologists, but may be specialists of any kind. Especially there is a specialisation training in pediatric intensive care. India is an example of how family medicine can be a foundation for emergency medicine training. Many private hospitals and institutes have been providing Emergency Medicine training for doctors, nurses & paramedics since 1994, with certification programs varying from 6 months to 3 years. However, emergency medicine was only recognized as a separate specialty by the Medical Council of India in July 2009. There are three universities (Universiti Sains Malaysia, Universiti Kebangsaan Malaysia, & Universiti Malaya) that offer master's degrees in emergency medicine – postgraduate training programs of four years in duration with clinical rotations, examinations and a dissertation. The first cohort of locally trained emergency physicians graduated in 2002. In Saudi Arabia, Certification of Emergency Medicine is done by taking the 4-year program Saudi Board of Emergency Medicine (SBEM), which is accredited by Saudi Council for Health Specialties (SCFHS). It requires passing the two-part exam: first part and final part (written and oral) to obtain the SBEM certificate, which is equivalent to Doctorate Degree. Most programs are three years in duration, but some programs are four years long. There are several combined residencies offered with other programs including family medicine, internal medicine and pediatrics. The US is well known for its excellence in emergency medicine residency training programs. This has led to some controversy about specialty certification. The American Board of Emergency Medicine (ABEM) is for those with either Doctor of Medicine (MD) or Doctor of Osteopathic Medicine (DO) degrees. The ABEM is under the authority of the American Board of Medical Specialties. The American Osteopathic Board of Emergency Medicine (AOBEM) certifies only emergency physicians with a DO degree. It is under the authority of the American Osteopathic Association Bureau of Osteopathic Specialists. The Board of Certification in Emergency Medicine (BCEM) grants board certification in emergency medicine to physicians who have not completed an emergency medicine residency, but have completed a residency in other fields (internists, family practitioners, pediatricians, general surgeons, and anesthesiologists). A number of ABMS fellowships are available for Emergency Medicine graduates including pre-hospital medicine (emergency medical services), critical care, hospice and palliative care, research, undersea and hyperbaric medicine, sports medicine, pain medicine, ultrasound, pediatric Emergency Medicine, disaster medicine, wilderness medicine, toxicology, and critical care medicine. In recent years, workforce data has led to a recognition of the need for additional training for primary care physicians who provide emergency care. This has led to a number of supplemental training programs in first-hour emergency care, and a few fellowships for family physicians in emergency medicine. "In 2010, there were 157 allopathic and 37 osteopathic emergency medicine residency programs, which collectively accept about 2,000 new residents each year. Studies have shown that attending emergency physician supervision of residents directly correlates to a higher quality and more cost-effective practice, especially when an emergency medicine residency exists." Medical education is primarily funded through the Medicare program; payments are given to hospitals for each resident. "Fifty-five percent of ED payments come from Medicare, fifteen percent from Medicaid, five percent from private payment and twenty-five percent from commercially insured patients." However, choices of physician specialties are not mandated by any agency or program, so even though emergency departments see many Medicare/Medicaid patients, and thus receive a lot of funding for training from these programs, there is still concern over a shortage of specialty-trained Emergency Medicine providers. In the United Kingdom, the Royal College of Emergency Medicine has a role in setting the professional standards and the assessment of trainees. Emergency medical trainees enter specialty training after five or six years of Medical school followed by two years of foundation training. Specialty training takes six years to complete and success in the assessments and a set of five examinations results in the award of Fellowship of the Royal College of Emergency Medicine (FRCEM). Historically, emergency specialists were drawn from anaesthesia, medicine, and surgery. Many established EM consultants were surgically trained; some hold the Fellowship of Royal College of Surgeons of Edinburgh in Accident and Emergency — FRCSEd(A&E). Trainees in Emergency Medicine may dual accredit in Intensive care medicine or seek sub-specialisation in Paediatric Emergency Medicine. Emergency Medicine residency lasts for 4 years in Turkey. These physicians have a 2-year Obligatory Service in Turkey to be qualified to have their diploma. After this period, EM specialist can choose to work in private or governmental ED's. The college of Physicians and Surgeons Pakistan accredited the training in Emergency Medicine in 2010. Emergency Medicine training in Pakistan lasts for 5 years. The initial 2 years involve trainees to be sent to three major areas which include Medicine and allied, Surgery and Allied and critical care. It is divided into six months each and the rest six months out of first two years are spent in emergency department. In last three years trainee residents spend most of their time in emergency room as senior residents. Certificate courses include ACLS, PALS, ATLS, and research and dissertations are required for successful completion of the training. At the end of 5 years, candidates become eligible for sitting for FCPS part II exam. After fulfilling the requirement they become fellow of College of Physicians and Surgeons Pakistan in Emergency Medicine (). Presently there are seven institutions where you can acquire this training which includes Shifa International Hospitals Islamabad, Aga Khan University Hospital Karachi, POF hospital Wah, Lady Reading Hospital Peshawar, Indus Hospital Karachi and Jinnah Post Graduate Medical Center Karachi. There are approximately 70 residents in different years of training. The list of Physicians cleared their exam from the College of Physicians and Surgeon Pakistan can be seen here (). The first residency program in Iran started in 2002 at Iran University of Medical Sciences, and there are now three-year standard residency programs running in Tehran, Tabriz, Mashhad, Isfahan, and some other universities. All these programs work under supervision of Emergency Medicine specialty board committee. There are now more than 200 (and increasing) board-certified Emergency Physicians in Iran. Ethical and medico-legal issues are embedded within the nature of Emergency Medicine. Issues surrounding competence, end of life care, and right to refuse care are encountered on a daily basis within the Emergency Department. Of growing significance are the ethical issues and legal obligations that surround the Mental Health Act, as increasing numbers of suicide attempts and self-harm are seen in the Emergency Department The Wooltorton case of 2007 in which a patient arrived at the Emergency Department post overdose with a note specifying her request for no interventions, highlights the dichotomy that often exists between a physicians ethical obligation to 'do no harm' and the legality of a patients right to refuse. Wikimedia Commons has media related to Emergency medicine. ^ a b Sakr, M (2000). "Casualty, accident and emergency, or emergency medicine, the evolution". Emergency Medicine Journal. 17 (5): 314–9. doi:10.1136/emj.17.5.314. PMC 1725462. PMID 11005398. ^ Razzak, J. A.; Kellermann, A. L. (2002). "Emergency medical care in developing countries: Is it worthwhile?". Bulletin of the World Health Organization. 80 (11): 900–5. doi:10.1590/S0042-96862002001100011 (inactive 16 February 2019). PMC 2567674. PMID 12481213. ^ "A very warm welcome to the website of the International Federation for Emergency Medicine.". http://www.ifem.cc/. 18 March 2011. ^ Bullock, Kim; MacMillan Rodney, William; Gerard, Tony; Hahn, Ricardo (2000). "Advanced Practice' Family Physicians as the Foundation for Rural Emergency Medicine Services (Part I)". Texas Journal of Rural Health. 18 (1): 19–29. ^ Bullock, Kim A.; Gerard, W. Anthony; Stauffer, Arlen R. (2007). "The Emergency Medicine Workforce and the IOM Report: Embrace the Legacy Generation". Annals of Emergency Medicine. 50 (5): 622–3. doi:10.1016/j.annemergmed.2007.05.025. PMID 17963988. ^ "Critical Challenges: Family Physicians in Emergency Medicine 2006, AAFP Position Paper". ^ Williams, Janet M.; Ehrlich, Peter F.; Prescott, John E. (2001). "Emergency medical care in rural America". Annals of Emergency Medicine. 38 (3): 323–7. doi:10.1067/mem.2001.115217. PMID 11524654. ^ Edmundson, L. H., L H (1994). "What is clinical emergency medicine? A family practice perspective. A paper presented at the Josiah Macy, Jr. Foundation Conference on the Future of Emergency Medicine, Williamsburg, Virginia, April 18". ^ Zink, Brian (August 2011). "Commemoration of the Alexandria Plan". ACEP News. ^ "What is Emergency Medicine?". Yale School of Medicine. Archived from the original on 19 November 2010. Retrieved 18 March 2011. ^ "Emergency Medicine". Emermed.uc.edu. Retrieved 28 October 2012. ^ Department of Emergency Medicine. "Department of Emergency Medicine". Keck.usc.edu. Retrieved 28 October 2012. ^ Zink, Brian (2013). "Graduate Resources Manual - Emergency Medicine" (PDF). Hennepin County Medical Center. ^ "Definition of Emergency Medicine". Clinical & Practice Management. American College of Emergency Physicians. Retrieved 16 November 2016. ^ Uscher-Pines, Lori; Pines, Jesse; Kellermann, Arthur; Gillen, Emily; Mehrotra, Ateev (28 November 2016). "Deciding to Visit the Emergency Department for Non-Urgent Conditions: A Systematic Review of the Literature". The American Journal of Managed Care. 19 (1): 47–59. PMC 4156292. PMID 23379744. ^ "Emergency Medical Technicians Use Checklist To Identify Intoxicated Individuals who Can Safely Go to Detoxification Facility Rather Than Emergency Department | AHRQ Health Care Innovations Exchange". innovations.ahrq.gov. Retrieved 21 November 2016. ^ a b Sasson, Comilla; Wiler, Jennifer L.; Haukoos, Jason S.; Sklar, David; Kellermann, Arthur L.; Beck, Dennis; Urbina, Chris; Heilpern, Kathryn; Magid, David J. (2012). "The Changing Landscape of America's Health Care System and the Value of Emergency Medicine". Academic Emergency Medicine. 19 (10): 1204–11. doi:10.1111/j.1553-2712.2012.1446.x. PMID 22994373. ^ "Medscape Physician Compensation Report 2015". www.medscape.com. Retrieved 28 November 2016. ^ "Physician Compensation Report 2015". www.medscape.com. Retrieved 28 November 2016. ^ Shi, L; Singh, D (2015). Delivering health care in America: A systems approach (6th ed.). Burlington, Massachusetts: Jones & Bartlett Learning. p. 264. ^ "Fact Sheets". American College of Emergency Physicians | News Room. Retrieved 28 November 2016. ^ Bebber, R. J.; Liberman, A (2005). "Reimbursement challenges for emergency physicians". The Health Care Manager. 24 (2): 159–64. doi:10.1097/00126450-200504000-00009. PMID 15923928. ^ a b Epstein, Arnold M. (2012). "Will Pay for Performance Improve Quality of Care? The Answer is in the Details". New England Journal of Medicine. 367 (19): 1852–3. doi:10.1056/NEJMe1212133. PMID 23134388. ^ "Recent Studies and Reports on Physician Shortages in the US: Emergency Medicine (2009) – "Emergency Care System Remains in Serious Condition"". October 2012. p. 13. ^ Sikka, Rishi (2007). "Pay for Performance in Emergency Medicine". Annals of Emergency Medicine. 49 (6): 756–61. doi:10.1016/j.annemergmed.2006.06.032. PMID 16979264. ^ "Emergency Medicine and Payment Reform // ACEP". www.acep.org. Retrieved 28 November 2016. ^ "Ibid". www.acep.org. Retrieved 28 November 2016. ^ a b "A Matter of Urgency: Reducing Emergency Department Overuse" (PDF). NEHI Research Brief. New England Healthcare Institute. March 2010. Retrieved 16 November 2016. ^ "Reducing Waste in Health Care". Health Affairs – Health Policy Briefs. Retrieved 28 November 2016. ^ Weber, Ellen J.; Showstack, Jonathan A.; Hunt, Kelly A.; Colby, David C.; Grimes, Barbara; Bacchetti, Peter; Callaham, Michael L. (2008). "Are the Uninsured Responsible for the Increase in Emergency Department Visits in the United States?". Annals of Emergency Medicine. 52 (2): 108–15. doi:10.1016/j.annemergmed.2008.01.327. PMID 18407374. ^ Sharma, Aabha I.; Dresden, Scott M.; Powell, Emilie S.; Kang, Raymond; Feinglass, Joe (2016). "Emergency Department Visits and Hospitalizations for the Uninsured in Illinois Before and After Affordable Care Act Insurance Expansion". Journal of Community Health. 42 (3): 591–597. doi:10.1007/s10900-016-0293-4. PMID 27837359. ^ "Characteristics of Frequent Emergency Department Users" (PDF). The Henry J. Kaiser Family Foundation. October 2007. Retrieved 16 November 2016. ^ "Uncompensated Care – HealthCare.gov Glossary". HealthCare.gov. Retrieved 21 November 2016. ^ "Medicare Program; Revisions to Payment Policies Under the Physician Fee Schedule for Calendar Year 2003 and Inclusion of Registered Nurses in the Personnel Provision of the Critical Access Hospital Emergency Services Requirement for Frontier Areas and Remote Locations" (PDF). Federal Register. Department of Health and Human Services, Centers for Medicare & Medicaid Services. 31 December 2002. Retrieved 16 November 2016. ^ Langland-Orban, B; Pracht, E; Salyani, S (2005). "Uncompensated care provided by emergency physicians in Florida emergency departments". Health Care Management Review. 30 (4): 315–21. CiteSeerX 10.1.1.517.2055. doi:10.1097/00004010-200510000-00005. PMID 16292008. ^ "Costs of Emergency Care Fact Sheet". American College of Emergency Phyicians. Retrieved 16 November 2016. ^ "New report projects a $5.7 billion drop in hospitals' uncompensated care costs because of the Affordable Care Act". News. U.S. Department of Health & Human Services. 24 September 2014. Retrieved 16 November 2016. ^ Schilling, Ulf Martin (2010). "Cutting costs: The impact of price lists on the cost development at the emergency department". European Journal of Emergency Medicine. 17 (6): 337–9. doi:10.1097/MEJ.0b013e32833651f0. PMID 20093935. Also: Schilling, Ulf (2009). "Cutting costs – the impact of price-lists on the cost development in the emergency department". Scand J Trauma Resusc Emerg Med. 17 (Suppl 2): P2. doi:10.1186/1757-7241-17-s2-p2. PMC 3313286. ^ Venkatesh, Arjun K.; Schuur, Jeremiah D. (2013). "A 'Top Five' list for emergency medicine: A policy and research agenda for stewardship to improve the value of emergency care". The American Journal of Emergency Medicine. 31 (10): 1520–4. doi:10.1016/j.ajem.2013.07.019. PMID 23993868. ^ a b c "42 U.S. Code § 1395dd – Examination and treatment for emergency medical conditions and women in labor". LII / Legal Information Institute. Retrieved 19 November 2016. ^ a b c Lee, T. M. (2004). "An EMTALA primer: The impact of changes in the emergency medicine landscape on EMTALA compliance and enforcement". Annals of Health Law. 13 (1): 145–78, table of contents. PMID 15002183. ^ a b c d Dollinger, Tristan (2015). "America's Unraveling Safety Net: EMTALA's Effect on Emergency Departments, Problems and Solutions". Marquette Law Review. 98: 1759. ^ "Jones v. Wake County Hosp. System, Inc., 786 F. Supp. 538 (E.D.N.C. 1991)". Justia Law. Retrieved 19 November 2016. ^ "Delaney v. Cade, 756 F. Supp. 1476 (D. Kan. 1991)". Justia Law. Retrieved 19 November 2016. ^ Circuit., United States Court of Appeals, Fourth (7 October 1992). "977 F2d 872 Baber v. Hospital Corporation of America Hca B". F2d (977). ^ "CMS Question and Answer Program Memorandum on EMTALA On-Call Responsibilities // ACEP". www.acep.org. Retrieved 19 November 2016. ^ Hyman, D. A. (1998). "Patient dumping and EMTALA: Past imperfect/future shock". Health Matrix. 8 (1): 29–56. PMID 10179281. ^ Oster, Ady; Bindman, Andrew B. (2003). "Emergency Department Visits for Ambulatory Care Sensitive Conditions". Medical Care. 41 (2): 198–207. doi:10.1097/01.mlr.0000045021.70297.9f. PMID 12555048. ^ "Improving efficiency and preserving access to emergency care in rural areas" (PDF). Report to the Congress: Medicare and the Health Care Delivery System. MEDPAC. June 2016. ^ Peterson, Lars E.; Dodoo, Martey; Bennett, Kevin J.; Bazemore, Andrew; Phillips, Robert L. (2008). "Nonemergency Medicine-Trained Physician Coverage in Rural Emergency Departments". The Journal of Rural Health. 24 (2): 183–8. doi:10.1111/j.1748-0361.2008.00156.x. PMID 18397454. ^ "$22.1 Million to Improve Access to Health Care in Rural Areas" (Press release). Health Resources and Services Administration. 26 September 2014. Retrieved 29 January 2017. ^ EMTALA. Centers for Medicare & Medicaid Services. http://www.cms.gov/Regulations-and-Guidance/Legislation/EMTALA/. Accessed 2016-11-15. ^ Kutscher B. Hospitals fall short on ACA charity-care rules. Modern Healthcare. http://www.modernhealthcare.com/article/20151028/news/151029886. Published 28 October 2015. Accessed 2016-11-16. ^ Blake, V (2012). "When is a Patient-Physician Relationship Established?". Virtual Mentor. 14 (5): 403–6. doi:10.1001/virtualmentor.2012.14.5.hlaw1-1205. PMID 23351207. ^ a b Rhodes, K. V.; Vieth, T; He, T; Miller, A; Howes, D. S.; Bailey, O; Walter, J; Frankel, R; Levinson, W (2004). "Resuscitating the physician-patient relationship: Emergency department communication in an academic medical center". Annals of Emergency Medicine. 44 (3): 262–7. doi:10.1016/j.annemergmed.2004.02.035. PMID 15332069. ^ Fischer, Miriam; Hemphill, Robin R.; Rimler, Eva; Marshall, Stephanie; Brownfield, Erica; Shayne, Philip; Di Francesco, Lorenzo; Santen, Sally A. (2012). "Patient Communication During Handovers Between Emergency Medicine and Internal Medicine Residents". Journal of Graduate Medical Education. 4 (4): 533–7. doi:10.4300/JGME-D-11-00256.1. PMC 3546588. PMID 24294436. ^ a b c d e Ethical Problems in Emergency Medicine. 2012. doi:10.1002/9781118292150. ISBN 9781118292150. ^ a b Fordyce, James; Blank, Fidela S.J. ; Pekow, Penelope; Smithline, Howard A.; Ritter, George; Gehlbach, Stephen; Benjamin, Evan; Henneman, Philip L. (2003). "Errors in a busy emergency department". Annals of Emergency Medicine. 42 (3): 324–33. doi:10.1016/s0196-0644(03)00398-6. PMID 12944883. ^ Risser, Daniel T; Rice, Matthew M; Salisbury, Mary L; Simon, Robert; Jay, Gregory D; Berns, Scott D (1999). "The Potential for Improved Teamwork to Reduce Medical Errors in the Emergency Department". Annals of Emergency Medicine. 34 (3): 373–83. doi:10.1016/s0196-0644(99)70134-4. PMID 10459096. ^ Fairbanks, Rollin J.; Crittenden, Crista N.; o'Gara, Kevin G.; Wilson, Matthew A.; Pennington, Elliot C.; Chin, Nancy P.; Shah, Manish N. (2008). "Emergency Medical Services Provider Perceptions of the Nature of Adverse Events and Near-misses in Out-of-hospital Care: An Ethnographic View". Academic Emergency Medicine. 15 (7): 633–40. doi:10.1111/j.1553-2712.2008.00147.x. PMID 19086213. ^ Robbennolt, Jennifer K. (2008). "Apologies and Medical Error". Clinical Orthopaedics and Related Research. 467 (2): 376–82. doi:10.1007/s11999-008-0580-1. PMC 2628492. PMID 18972177. ^ "When Doctors Admit Mistakes, Fewer Malpractice Suits Result, Study Says". Health News / Tips & Trends / Celebrity Health. 17 August 2010. Retrieved 19 November 2016. ^ Gallagher, Thomas H.; Waterman, A. D.; Ebers, A. G.; Fraser, V. J.; Levinson, W (2003). "Patients' and Physicians' Attitudes Regarding the Disclosure of Medical Errors". JAMA. 289 (8): 1001–7. doi:10.1001/jama.289.8.1001. PMID 12597752. ^ "Emergency Medicine: What is it?". Australian Medical Association. Australian Medical Association. Retrieved 1 February 2017. ^ "Emergency Medicine – Medical Specialties – Medical Specialties – Explore Options – Choose Your Specialty – Careers In Medicine". www.aamc.org. Retrieved 3 May 2017. ^ "Health Insurance Regulations 1975 (Cth) Schedule 4". ^ "HB03 Elements of Training" (PDF). Australasian College for Emergency Medicine. ^ "HB10 Joint Training Programs" (PDF). Australasian College of Emergency Medicine. ^ "EM Certificate and Diploma". Australasian College of Emergency Medicine. Archived from the original on 12 November 2013. ^ a b "Emergency Medicine (EM)". Archived from the original on 27 February 2009. ^ Cho, E; Akkapeddi, V; Rajagopalan, A. "Developing Emerg Med Through Primary Care". National Medical Journal of India. 18 (3): 154–156. ^ Suter, Robert E (2012). "Emergency medicine in the United States: A systemic review". World Journal of Emergency Medicine. 3 (1): 5–10. doi:10.5847/wjem.j.issn.1920-8642.2012.01.001. PMC 4129827. PMID 25215031. ^ "Subspecialty Certification". ABEM. Retrieved 29 June 2011. ^ Gerard, W. A.; Staffer, A.; Bullock, K.; Pugno, P. (2010). "Family Physicians in Emergency Medicine: New Opportunities and Critical Challenges". The Annals of Family Medicine. 8 (6): 564–5. doi:10.1370/afm.1209. PMC 2975696. PMID 21060129. ^ Carter, Darrell (2009). "CALS Training Provides Solution to Emergency Provider Shortages". Emergency Medicine News. 31: 1. doi:10.1097/01.EEM.0000361892.01557.a0. ^ "The Department of Family Medicine Emergency Medicine Fellowship". University of Tennessee Graduate School of Medicine. University of Tennessee Graduate School of Medicine. Retrieved 16 November 2016. ^ "American Academy of Emergency Medicine". AAEM - American Academy of Emergency Medicine. Retrieved 15 October 2018. ^ Baumann, Michael R.; Vadeboncoeur, Tyler F.; Schafermeyer, Robert W. (2004). "Financing of Emergency Medicine Graduate Medical Education Programs in an Era of Declining Medicare Reimbursement and Support". Academic Emergency Medicine. 11 (7): 756–9. doi:10.1197/j.aem.2004.04.003. PMID 15231465. ^ Shi, L; Singh, D (2015). Delivering health care in America: A systems approach (6th ed.). Burlington, Massachusetts: Jones & Bartlett Learning. p. 131. ^ Hatley, T; Patterson, P. D. (2007). "Management and financing of emergency medical services". North Carolina Medical Journal. 68 (4): 259–61. PMID 17694845. ^ "Recent Studies and Reports on Physician Shortages in the US". Association of American Medical Colleges. 2012. ^ "The College of Emergency Medicine. A trainee's guide to Specialty Training in Emergency Medicine". Royal College of Emergency Medicine. July 2015. Retrieved 8 February 2016. ^ Marco, Catherine; et al. (2011). "Ethics Curriculum for Emergency Medicine Graduate Medical Education" (PDF). The Journal of Emergency Medicine Graduate Medical Education. 40: 5 – via Elsevier. ^ Procter, Nicholas (2011). "Emergency Mental Health: Crisis and Response". AENJ. 11: 70–71. ^ a b Ryan, Callaghan, Christopher, Sascha (2010). "Legal and ethical aspects of refusing medical treatment after a suicide attempt: the Wooltorton case in the Australian context". Medical Journal of Australia. 193: 239–242. Tintinalli, Judith E. (2010). Emergency Medicine: A Comprehensive Study Guide (Emergency Medicine (Tintinalli)). New York: McGraw-Hill Companies. ISBN 978-0-07-148480-0. "WikEM: The Global Emergency Medicine Wiki". Los Angeles, CA: OpenEM Foundation.